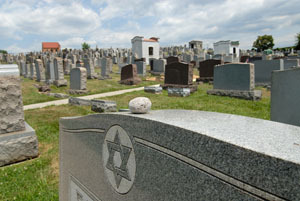 Many people come to InterfaithFamily to learn about Jewish death and mourning practices. If you are in an interfaith family, you may be coping with some unusual circumstances around death: you could be going to your first Jewish funeral or house of mourning, and want to know what to expect. You might even be in mourning for a close relative the first time you are exposed to a Jewish funeral. Or you might be planning a funeral for someone who has asked for a Jewish burial, and not be quite sure what that means. You might be a Jew burying a family member who is not Jewish, or vice versa. If you are in an interfaith marriage, you may be trying to figure out in advance how to negotiate being buried next to your spouse with Jewish ritual when you die. We give a brief overview here of some of the most typical Jewish death and mourning rituals and practices, and of some of the issues that may come up for people in interfaith families. Whatever choices you make around death and mourning, we hope that you find comfort in them. Why Don’t Jewish Funerals Have an Open Casket?